This week we are moving the server to a new home in what was the stationary cupboard (as part of the downstairs refurbishment). So last week we were cleaning out the old stationary cupboard and as you can imagine, there were things hidden away in there that hadn't been seen for ages. One such little nugget was this pile of promotional ash-trays, back from a time when handing out promotional ash-trays was an entirely acceptable thing to do. They came emblazoned with out telex number(!) and our phone number beginning with the area code 01. I'm sure this had become 0108 by the late 1990's and I think there was an 081 version since around 1990. That makes these at least 25 years old! 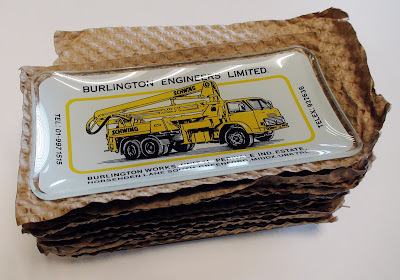 As expected this was from the time when we were still Burlington Engineers and wouldn't become part of the Schwing Stetter group for at least another 16 years (see more about our company history here). Of course we were still working with Schwing pumps back then. In fact we had been doing so since before 1962 when we were made the UK and Irish distributor for Schwing GbmH. Compared to that length of experience, this ash tray is positively modern!